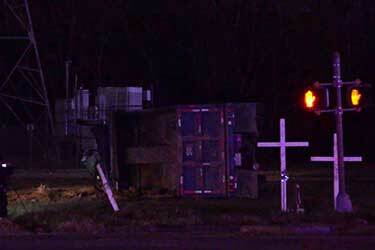 The Houston Police Department are investigating a fatal crash between a dump truck and a car on Monday, December 3rd. The crash happened around 2:20 p.m. at 7800 South Sam Houston Parkway East service road near Telephone Road. The driver of a blue dump truck was traveling east along the South Sam Houston Parkway East feeder road, ran the red light at the intersection of Telephone Road and slammed into the side of a silver Scion xA. The car spun out of control and stopped in the median between the feeder and tollway. The impact of the collision caused the dump truck to skid off the roadway and flipped on its side. The male driver of the Scion was transported to Clear Lake Regional Hospital where he was pronounced deceased. The driver of the dump truck was taken to Memorial Hermann Hospital where he was treated and released. No charges have been filed at this time. The crash remains under investigation and police reports will be made available in ten days.